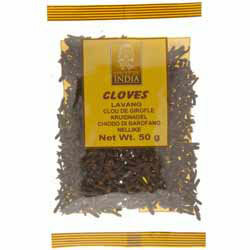 Cloves are used extensively but sparingly in Indian cuisine, and are a key ingredient in garam masala spice blends and chai (spiced tea). "Dear Spices of India, My first order arrived this morning and I am delighted with the way everything was so carefully packaged. Thank you for this and also for the prompt delivery."